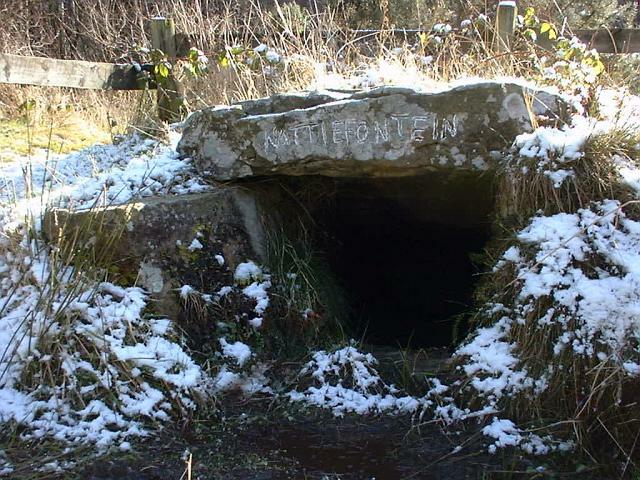 Old Wives Well is located on the edge of a tree plantation by the roadside to the north of Stape. 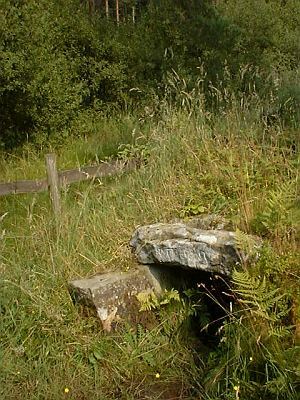 A low grassy mound covers a rough stone built chamber in which the spring water collects, with the overflow seeping away in a run off channel. Originally the well was located on open moorland, and an old photograph shows the well before the trees were planted, (which must have affected the water level in the well to some degree). The well is also located by an old track known as Wades Causeway, which was assumed to be a roman road, but it has recently been suggested that it may be earlier or later in date, possibly prehistoric or even medieval in date. Folklore records that the road was made by a giant called Wade, so that his wife, Bell, could more easily travel the long distance across the moors from their home at Mulgrave, to Pickering, where she went to milk her giant cow. Peter walker in his book on folktales and legends of the Moor'(1) describes the giantess Bell as the Old Wife and if this was the case then it could explain why the well, is so named. If Bell was the Old Wife, then perhaps Wade was the Old Man of the moors see Old Man's Mouth - Spring. On the stone lintel over the well chamber are the words "NATTIE FONTEIN", carved in rough letters. It has been suggested that this could be derived from 'Fons Natalis' - a Celtic water nymph. On a visit to the well in June 99 it was noted that the N and A in "NATTIE" are carved in such a way that the word could be read as "MATTIE FONTEIN" perhaps meaning "Mother Fountain". This might then be another reference to the Old Wife ? (need to recheck this). Colin Coulson has drawn attention to the latin word 'natalis' meaning 'birth' and its link with the roman Festival 'Dies Natalis Sol Invictus' (day of the birth of the unconquered sun) which took place on the 25th December. Natalis also gave rise to the welsh word 'Nadolig' - meaning Christmas, 25th December being the traditional birth date of Jesus, and the time of year when the sun is 'reborn' at the winter solstice. This has led him to suggest that Nattie Fontein could be a medieval latin version of 'Natalis Fontana' - the winter solstice spring. Further details on Colin's research will be available in his forth coming book 'Many Dark Secrets - a history of the North York Moors'. Wade, Bell, The Old Wife and Bride are connected with several natural features and prehistoric sites around the North York Moors which led the archaeologist, Frank Elgee, to suggest that the Old Wife tradition may have origins dating back to a Bronze age Fertility goddess. Access - A forestry commission signpost marks the short path to the well. Condition - Excellent. no real change since our visit in 1988 and on a visit in June 99 there were still pieces of cloth tied to nearby branches.